White roses symbolize love and peace. You don’t need even a single word to say someone “I Love You” when you are carrying white roses. This is a flower arrangement that would bring more romance to your life for sure. 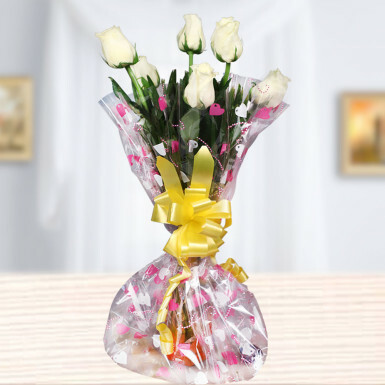 White roses are elegantly wrapped in cellophane packing and it is oozing out a beautiful charm. So, whenever you have to cheer your lover during hard times or with a loved one speedy recovery from illness, let this bouquet of white blossoms weave their magic.